40-year-old actor Rhassan Orange has appeared in a number of TV and film roles. He played “Tek” Kramer for four years on famous soap-opera Days of Our Lives. The character he’s most known for, however, is 27-time world champion Renato Laranja. Making fun of the stereotypically macho Brazilian jiu jitsu instructor, Rhasaan quickly made a name for himself in the grappling world. His YouTube videos are painfully funny, and his satiric seminars hit way too close to home. If you have been around BJJ for a while, you’ve experienced an instructor with at least some of the ridiculous sentiment Rhasaan makes fun of in his comedy. 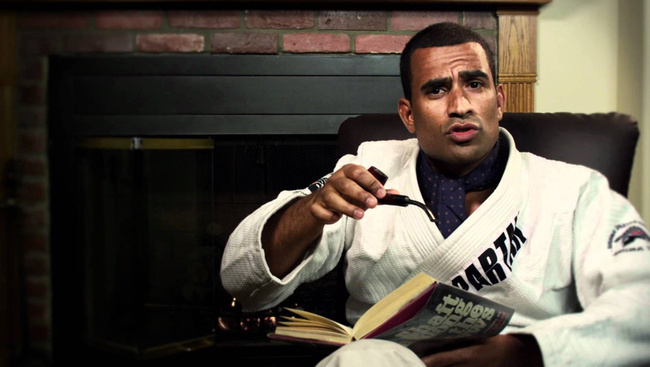 When Renato Laranja (the martial arts’ Andy Kaufman?) first appeared, not everyone knew if he was real. Since then, he’s been accepted (even by Brazilian instuctors) as the go-to martial arts comic. But, what MMA fans might not know is that he actually trains—why else would be have such an acute sense of the hero-worship that goes on behind the closed doors? First reported by BJJEE.com, Rhasaan has made it to the finish line and was awarded his "black beltch" by Eddie Bravo (the guy who tapped Royler Gracie one time). Porra. All kidding aside, we are big fans of Rhasaan and we bow to the newly crowned black belt. Congrats!